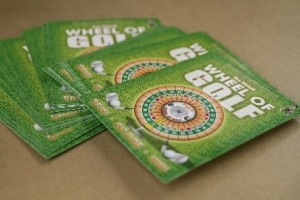 Essentially it is a roulette wheel with a twist. 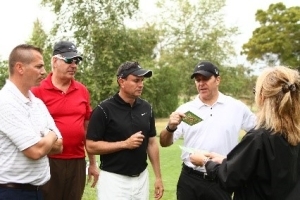 All the numbers on the WOG are golf scores from 32-41. Golfers spin the WOG twice to get an 18-hole score! 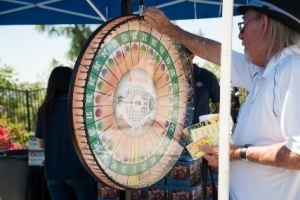 During the Registration portion of an event golfers who buy the Morongo Mulligan Package get to spin the wheel before the shotgun start. The golfer who spins the lowest 18-score wins a one-night stay at the Morongo Casino Resorts and Spa plus two rounds of golf at the Morongo Golf Course at Tukwet Canyon. 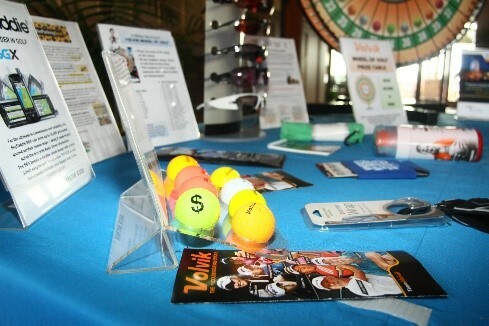 This is how we introduce the WOG and our sponsors. 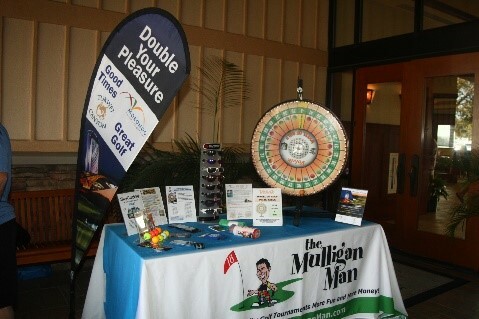 Surround the WOG are 8-foot banquet tables where we display our sponsors. 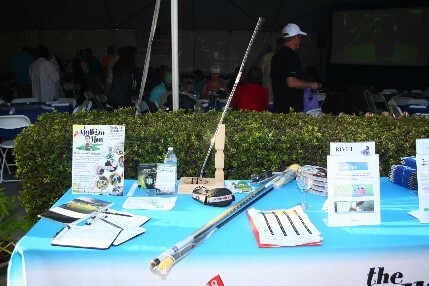 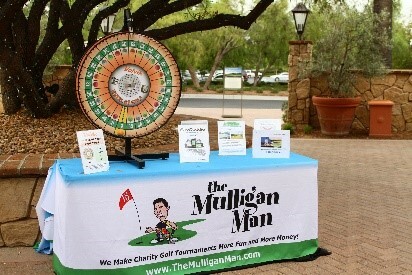 At the evening banquet every golfer will win something from our sponsors based on the score they spin. 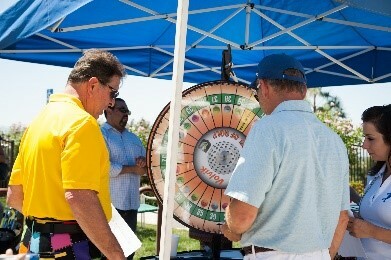 Just like Las Vegas when a roulette wheel spins people stand around and watch. They also look at our sponsor presentation which is one of the ways we market our sponsors. 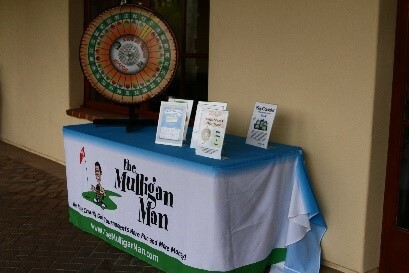 During the tournament our Mulligan Girl Cathy visits each group with a deck of Wheel of Golf playing cards. 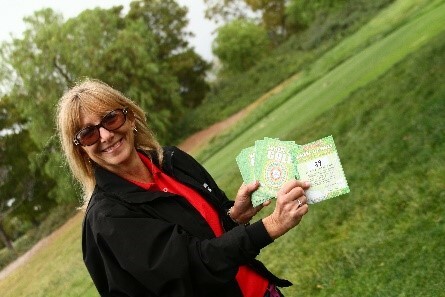 She fans the deck and each golfer choses a card which already has their front nine score on the back of the card. 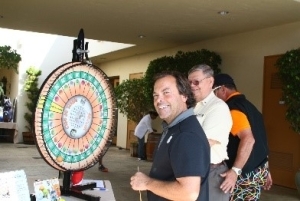 We do this to speed up the redemption process because during the cocktail hour we won’t have enough time to allow the every golfer to spin the WOG twice to get their 18-hole score. 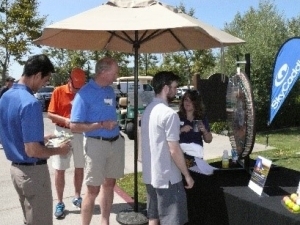 During the cocktail hour after the tournament golfers return to the WOG to spin the wheel to win their prize. 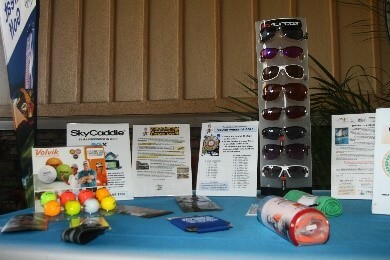 The prizes are all donated by our sponsors. Again the wheel is surround by 8-foot banquet tables which feature counter displays from our sponsors. 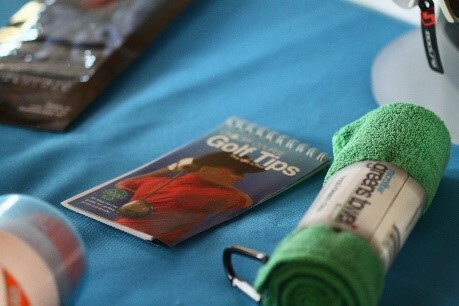 It is fascinating to watch as the golfers hang around the WOG watching players spin while window shopping our sponsor presentation. 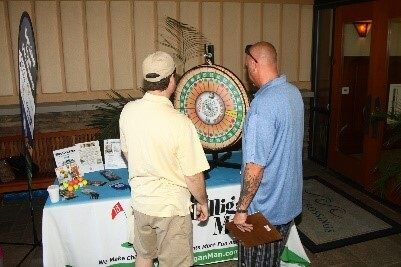 Mentally they look at what they would like to win and then spin hoping to land on their numbers. 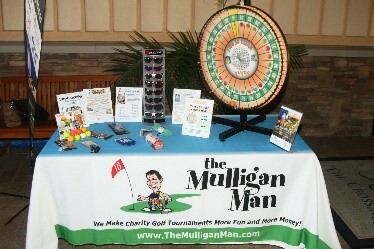 Our sponsor are given the same space they might get on a Pro Shop counter to market their product. Those displays can be as simple as a one-sheet in a Lucite standup to existing point-of-purchase displays they use in their retail marketing. 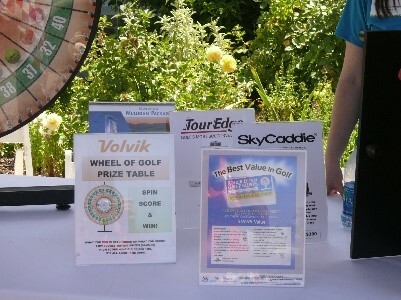 Some sponsors provide portable DVD players with endless loop videos with information about their product. Some sponsors provide walk-away brochures. Some have discount cards. While the space our sponsors get is limited, how they choose to promote their product is up to them.